You know how it is, when you get a new outfit and your mind whirrs wondering what accessories to wear with it. I hadn’t expected the blog to be the same but no sooner was it was it newly minted when I started thinking now it could best be decorated. The blog accessory I lust after is called the link within, it allows blogs to display thumbnail pictures of earlier posts under the current post with a brief summary of what the older posts contains. The hope being that you dear readers will start clicking on these thumbnails and while away hours of your lives fascinated by my previous miscellaneous musings and meanderings. I wish. Well it was not to be as the link within is a plug-in which is not available on my blogging platform wordpress.com. To have it, I could migrate to wordpress.org but that seems a tad complicated as it involves finding a server to host the blog and I am still in recovery from the tech trauma of setting up the blog in the first place. What I have done is set up a Tumblr. It’s not a blog accessory more of a blog adjunct. I take my camera with when I am out and about and often snap things that inspire me. Sometimes these pictures don’t fit naturally into the stuff I post on the blog, so I have given these photographs a home over at Tumblr; I hope you will check them out some time, to have a look click here. 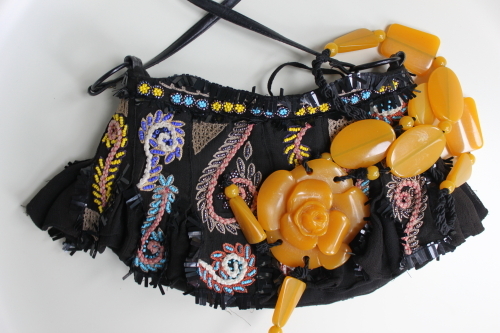 Note: I have had the bag in the picture for several years it’s by French brand Jamin Peuch and the yellow flower necklace I found in a shop in the Marais about five years ago.